Expedition Nevado Pisco and Huascaran. The Cordilliera Blanca in the region of Ancash is known as one of the best hiking regions worldwide. The climate is convenient ( best seasons from march till September) and the access to the top is relatively easy. The Cordilliera Blanca, including over 50 mountains above 5700m, is the highest range of the American continent. The name – white Cordillera- can be seen as a hint concerning the heavy glacial stage. A major part of the Cordillera Blanca has been declared to the national park Huascaran in 1975, meaning that it is under total protection. For an entrance fee, the park can be visited and is considered as one of the most interesting tourist-sites of Peru. Due to the global warming, the glaciers of the Cordillera Blanca decline significantly, especially since the end of the 1980's. This shows how important it is to maintain a sensitive behavior with the resources of our earth. For that reason we avoid domestic flights whenever possible. The main location on the boarder of the Cordillera Blanca is called Huaraz. It is an important central point for trekkers and hikers, as well as a starting point of several challenging hiking tours. A lot of travel agencies and other service companies have settled down here and offer services for every taste. Of course, Huaraz is also an important starting point and center for our tours. Usually the journey begins in Lima, 400km towards north, the bus ride to Huaraz will take us about 6-8 hours. Starting points for our tours are Huaraz, Carhuaz, Yungay and Caraz. At first we will travel from Lima to the mountain climber's capital Huaraz, passing breathtaking Andean passes. From here on, we will start our first hike to the National Park Huaraz and the opposing Cordillera Negra. Besides we will visit Chavin de Huantar, one of the most exciting ruins of Peru, followed by some acclimatisation-tours around Huaraz, including some small hills and scenery tarns. After a few days of shorter tours we want to know how the wind blows. Our first big summit will be the 5772m high Nevado Pisco. Not for a long time yet the most challenging of our destinations, nevertheless just the right place to enjoy a fantastic view above the other, higher mountains. Afterwards we will spend time on one of the gigantic ones, the 6770m high Huascaran, the highest mountain of Peru. This challenging summit will take us at least 6 days, but that's worth it, as the terrific view from the top of this huge ice-giant makes our day! Of course, a profound hiking knowledge and a very good physical condition are indispensable for this tour. Departure and arrival airport is Lima, with more than 11million inhabitants on of the biggest cities in South America. After picking you up from the airport, you will check into the hotel where you will have some time to relax or start a first city investigation. At the end of the day you can look forward to a typical meal in a simple restaurant in Lima. Today we will travel by bus, enjoying a beautiful view on the different landscapes of Peru. We will pass by the coast towards north, with a stunning view of the sea, as well as the sandy desert near the Peruvian coast. Later on we will pass through the Cordillera Negra, crossing the 4000. m boarder for the first time. From here we will relish a terrific view above one of the most impressive mountain sceneries of the world. Here we will check into our hotel and head off too a brief visit of the city. Visiting the most ancient stone construction worldwide will be part of our program today. Chavin de Huantar is a complex of ruins in form of a temple-castle. The drive leads us past a crystal clear lagoon and later on sinks behind a dark tunnel. When we start our round tour it is going to get bright again so that we visit Castillo, an impressive fortification on a hill. Here we can also observe El Lanzon, a 4,5meter high lance in form of a granite –Monolith. The eastern-gate with the Tello Obelisk and the Raimondi Stele are further highlights of our tour. Later on we will return to Huaraz, where we will have some time left to take a rest. The ride leads us above a stunning Andean pass with interesting impressions in the southern part of the Cordillera Blanca. Today we will take a gambled-taxi up to Wilkawain, from where we will start our marvelous hiking tour. Before turning into a scenery high valley, we will climb up the Nevado Churup. Depending on your individual mood and physical condition, now it's time to choose between several possibilities. Either we will climb up further on steep walls right into the Andean valley, where you can see quite a few impressive waterfalls. Or we will climb up further on to a pre-apex of the Cordillera Blanca. Here we can enjoy glorious views of the mountain scenery. In the following we will walk through green fields back to Wilkahain, where we will take a look at the ruins. From here on we will take the next Collective back to Huaraz. Who feels like it can also walk the seven kilometers. The route bypasses original Andean villages and farming land, and is worth the effort. Today we will visit the National Park Huascaran as well as the Lagunas Llanganuco and 69. The turquoise blue lakes lie right beneath the glorious mountain scenery around Huandoy and Huascaran. The first lakes lay at a height of 3800 meters, Andean Hummingbirds, hawks, Vicunas and Alpacas and a bunch of other species can be found here. Possibly one of our next destinations, the Chopicalqui can be seen from here on. Now we will drive a bit further into the park. Underneath the pass of Portachuelo we will drop out of our taxi at a height of 4000m. After a short climb up we will arrive at a beautiful river surrounded by a magical Andean valley. The ascend gets steeper and leads us past impressive waterfalls up to the top. Here we can enjoy a magnificent view over huge glaciers, and also the Huascaran will join this picture. Further up, we will find the lagoon 69, one of the most beautiful mountain lakes of the Andes, right above appears the enormous ice-fledge of Chacraraju. Depending on how much time is left or on your energy we will walk back to the Refugio Peru, starting point for the ascent to Nevado Pisco. However this will take us another 2 hours. Than we will return to Huaraz to have dinner. Today we will drive by bus or taxi into the Cordillera Negra, the other side of the Santa valley. This is a perfect point to start some beautiful tours, especially because of the perfect overview of the Cordillera Blanca with all its icy hills. We will drop off at the Puntan Callan, in a height of 4225 meter. From here on we can climb up the 4622high Jircohirca. This will take us not more than 2 hours. From here we enjoy magnificent views over Huaraz and some other huge mountains around, including the Huascaran and even closer the Huantsan, right above the city. Also the not so close by Cordillera Huayhuash can be overviewed from here, if the sky is clear. Before returning to Huaraz we will climb up another 2 or 3 mountains. Today we will visit the first bigger Summitin the Cordillera Blanca, namely the Pastoruri, in a height of 5300meters. We will drive up to 4800 meters, before climbing up the rest. Here, our Partner agency will do some ice climbing with whom ever is interested. This is a good activity to get used to the height as well as a good exercise to be prepared for the final ascent to the huge top. In the past the Pastoruri was known for its accessible glacier-hollows, today the glaciers are left, but all of the hollows have gone due to the global warming. Nevertheless this is a breathtaking trip with fantastic views above several mountains of 5000 and 6000 height. On the way back we will drive through a Puna landscape with another attraction, namely the Puya Raimondi. Counting more than 10 years this is one of the oldest pineapple plants worldwide, some of them are believe it or not, are over 100 years old. Not less spectacular is our drive back to Huaraz, where we will finally have dinner and return to our hotel. Today we will take the bus early in the morning to head off to Catac. From here on we take a taxi to the lagoon Querococha, which we have already passed by on the way to Catac. This time we will walk around half of the lake before climbing up to a unknown mountain valley. Next to the beautiful view over the lake, we will also see parts of the arising Andeans. We will carry on upwards and finally leave our trail just underneath a lovely small summit. We want to climb this summit on its stony trail. We hike around the mountain before conquering a short belt of rocks. Shortly bevore we arrive at the summit, smitten with the overwhelming view over the Andes. There is no other possibility than climb in the same stony way back down, before taking another walk around the lake. Finally, we will return to Huaraz via Bus, Taxi or Collectivo. 10. Day: Rafting tour at Rio Santa To recover from our hiking tours, we will do a joyful Rafting Tour on the Rio Santa, guided by our Partner agency. Let's get down to brass tacks and visit the Nevado Pisco (5752m)! Although this is not one of the most difficult mountains, we have to bear in mind that this is a realy high one with icy passes of 30degrees and chinks, not to be overlooked the height. To begin with we will climb up to our camp. We will start at the 4700 meter high Portachuelo de Llanganuco, carrying on to a western trail towards our base camp in Pisco. After having managed the first steep ascend, we will carry on walking on a flatter part. Another ascend follows, before arriving at our base camp, next to small waterfall. Today we'll take it easy, the high camp of Pisco is not too far away. We walk through glorios highlands and gaze at the surrounding ice-giants. Although it would also be possible to conquer the Pisco within 2 days, we allow us another day to get used to the height. After building up our base camp we will climb up a bit further , for example to the glacier border next by. Quite some time before sunset we start our climbing to the top. Our headlamps lighting the way through stony grounds and easy glaciers. Later we pass a field of slidy rocks below the Huandoy glacier where we have to calculate with falling stones. On the other side of the glacier, thankfully, dark rocks serve us a better way to the top of Nevado Pisco, although they don't seem to be quite consistent. Soon we have arrived at the entry to the glacier of Nevado Pisco. In the majority of cases there is a clear trace showing us the way to the saddle. So, we have to follow the steep ascend before reaching the top of 5725 meters. Not only the highest mountain Peru's, the Nevado Huascaran, but also several other mountain giants can be observed from here. Also Huandoy and Chopiqualqui appear in the direct neighborhood. Not long time after it gets cold and we will head off to climb down the pass, where at the end a vehicle is waiting for us to take us back to the Santa valley. Today, we have a day of rest to recover from all the strains of the last days, Huaraz offers several possibilities to relax. Of course you can create this day to your personal taste. After having taken a good rest yesterday, today we will start to climb up the highest mountain of Peru, the 6770 high Huascaran. From Huaraz we will drive towards Yungay and further towards the village Mancos to Musho, where at a height of 3000m our tour begins. From here on we will walk past a small graveyard and past a scenetic eucalyptus forest. Higher up these are replaced by quinoa trees, which are nowadays quite rare in South America. At a height of 4100 meters, we reach a free area, just as right to build up our tents. But don't worry, for the 1000 altitude difference, we will make use of packing animals. Later on the Mulas can be replaced by Porters, as they are not very good in moving in rocky and icy regions. 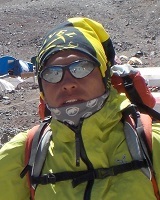 Today we will climb up to Camp 1, conquering an altitude difference of about 1000m again. Luckily, we don't have to carry our luggage by ourselves. We will pass by several Panorama areas with lots of interesting forms of vegetation. These lead us directly to the lowest border of the glacier, where we will put on our crampons for the first time. At the most 30 degree steep is the glacier, but the few small chinks are not risky. Our camp is located at a height of 5200m on a flat icy area. Today we will leave our camp very early in the morning. The ice has about 40 degree and we can move forward easily. At least until we reach the key site of the whole trip today, the "Canaleta" a 70 degree steep Icecolour. Luckily enough that there are only 100meter more to go. After overcoming this, the way gets significantly flatter, nevertheless there appear to be a few chinks on the way. Later on we have to pay attention again, as we will pass through a endangered avalanche area. After overcoming also this barrier, we will build up our camp underneath the Garganta, a wide wall of ice. This is located on 5900meter on a more or less wind-safe place. From here on we will start our trip to the top, but don't worry, this can wait until tomorrow. Now it's getting serious, at 2 o'clock in the morning we will make our way to the highest peak of Peru. . First of all the Garganta itself has to be overcome, the steepness adds up to 45 degree, so a lot more than yesterday. Beneath and around us appear gigantic Seracs, between which we will find our way. The way is getting flatter and soon we arrive at the top. The reward will be the very viewpoint in Cordillera Blanca that you surely won't forget. Breathtaking wide views into the Santa valley and endless seems the wideness of the surrounding icebergs. However we cannot remain too long in amazement as it is too cold and on top of that there is a more than challenging way down waiting for us. We will take the same way down as up and should finally arrive at Campo 1. At Campo 2 we will break down our tents and take a rest to enjoy a hot cup of chocolate or tea. Before building up our new camp, the Canaleta has to be overcome a last time by roping down. Today we will descend further. Depending on how far we got yesterday, we will finally have some more time to relax and enjoy the glorious mountain landscape surrounding us. We carry on downwards, until reaching the base camp in 4200 meter. Here we can look forward to a nicer, more comfortable and warmer camp than yesterday. Today we don't have to get up early as we will have enough time to climb down the 1100 meter. Again we will use the same route as ascending, through miraculous mountain forests and ancient shepherd trails. Our vehicle is supposed to wait in Musho for us, so that we can travel back to Huaraz comfortably. Also this day is available at your individual disposal. Most of you will be glad to be back to civilization and to indulge from the luxury that the city-life has to offer. If you are in the mood, you could for example visit the thermal baths nearby, this is surely a good idea to relax from the last days. Or you decide to sleep the whole day, whatever you wish to. This day we will almost entirely spend in the bus, as unfortunately we will have to return to Lima. That for, we will cross once again the Cordillera Negra and take a look back to the huge mountains of Cordillera Blanca. Of course we won't miss a last glimpse on the Huascaran. In the evening we will arrive in the capital, who likes to can for the last time hurl into the vibrant nightlife of this Peruvian metropolis. Definitely the saddest day, as today you will have to return home. Of course our guide will be glad to accompany you to the airport. Before heading back home we will skim through Peru mentally. Interesting keen insights of the Andean and Amazon regions let us recall the most exceptional memories of our journey and create a lot of space for more ideas and itinerary. We hope that you enjoyed your special South-American experience and that it won't be your last one! A good physical fitness is desired and definitely a huge advantage.